Mixed floral hanging containers have become the rage across the country, and thanks to the coconut liner it is easy to jump on the basket bandwagon. It wasn’t long ago that you only saw such beautiful displays when visiting mild-climate tourist areas, and now everyone can either buy them already made or be like Monet, and create a piece of floral art. From the big-box store to the independent garden center, it seems they have everything you need. For those who like the creative process, or want combinations that aren’t easily found, then the wire basket is the way to begin. This also applies to baskets that have a shape more like a window box and can be used as such. They are also easily attached to the railing of a deck. The coconut liner holds potting soil and of course it drains with perfection. It is also a lot more durable than you think and easily replaced with another liner when it finally wears out. I like to use really good potting soil that is lightweight and contains slow-release fertilizer to give the plants a quick jump on growing. At the Columbus Botanical Garden in Georgia, we have had wonderful baskets with geraniums, Swedish ivy and different colors of bacopa for about 6 weeks. This is a great way to grow geraniums but, surprisingly, the small-flowered bacopas have really stolen the show. The combination of pink ones with some lavender blue has really been eye-catching and inspiring visitors to find a spring in their steps. Planting level should be about three-fourths of an inch below the top of the moss. By all means, place a plant in the center of the basket. You may wish to select one that will climb a hanging chain. 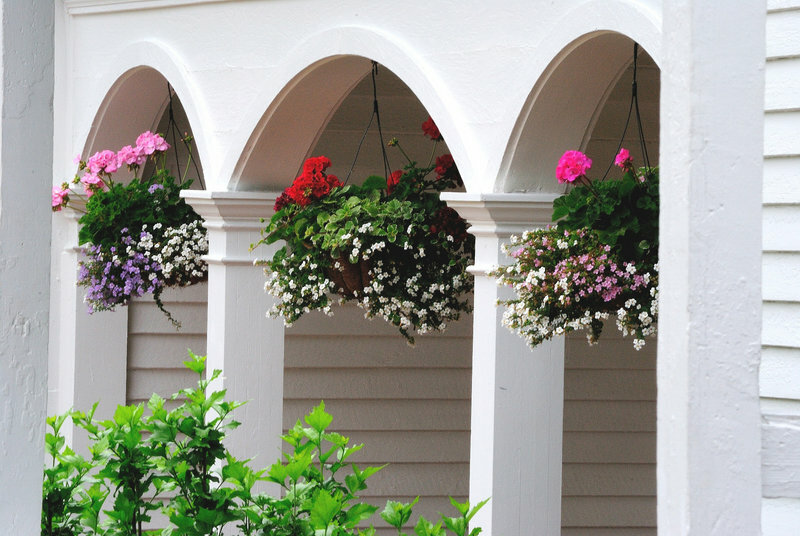 At home, I use baskets that are more like window boxes and attach to a deck railing. I used the same type of soil, but this time was even more aggressive in my plant combinations. I started in the center and worked my way outward each direction with the design. I planted a scarlet milkweed as the center plant. It is flanked by large orange African marigolds, blue Wave petunias and creeping Jenny that will eventually tumble over the edge, providing a nice vertical element. At the botanical garden, we have fern baskets that are great, but those packed with color are the real attention grabbers.